[By Nick] Today marks 3 years of dealing with Dubba's last second posts and having to edit all of his photos. Wait, that's what he puts up and does for me? He's a saint and I couldn't thank him enough for all he has done for me. He's opened up so many doors and opportunities that 3 years ago I would've laughed about. He's become a second father even if he won't adopt me, I've adopted him in my book. He knows when I take over the ice cream world, I'll find a nice retirement home for him to make his sundaes at. I also have to thank you guys for sticking around and for every single comment, feedback and recommendation that you've sent my way. Without your support, I would've left Dubba to review vegan desserts on his own long ago. Now Dubba does state of the freezer posts when it's his anniversary but I like to do reviews. So instead of showing you the current messy situation I call my freezer (which you can see on occasion in my instagram or twitter feeds. Warning: While my instagram is mostly food related, my twitter is my personal account so follow with caution. I may or may not post about the current situation of my pants on occasion), let's take a trip to Cold Stone and celebrate! This creation sounds fitting for today. Oh wait, I also have to thank one more person. Thanks to the beautiful Cold Stone employee of Albany for hooking me up with this for free. Not sure if it was ‎my charm, face or just her feeling generous but it definitely made my day. 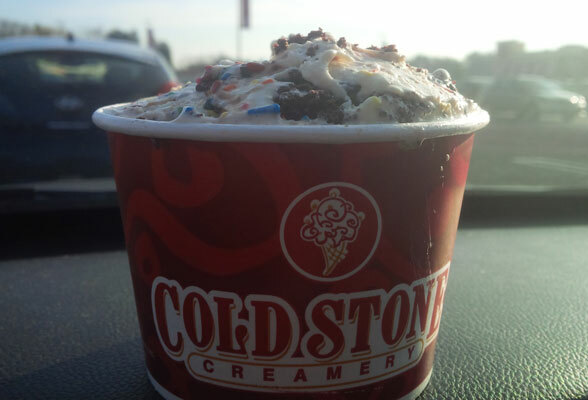 If you're reading this, let's talk because ice cream is on me next time. Back to the creation... I don't believe I've ever had their cake batter ice cream but it's one of the best of the variety I've had. It tastes almost identical to licking the spoon when making a cake. Sweet, slightly eggy, and delicious. I'm not a fan of sprinkles because they're just there to make things pretty and not add anything but a slight crunch. Thankfully they did their job on both parts and gave this one a "fun factor" as Dubba would say. The brownie chunks were prevalent and worked well with the base. I was curious how they would mesh but it was a good combination. I know brownie stuffed cookies are a thing but are there cakes that are stuffed with brownies out there? If not, someone make me one because I think it'll be epic. The brownies could've been a bit more moist but there's only so much I can ask for especially not knowing how long the brownie had been out waiting to meet its fate. At least they're very fudgy in flavor which went well with the fudge sauce that was mixed in. All in all, this is a solid creation and would love to see someone make it in a mass produced container so I could enjoy it outside of having to only go to Cold Stone. Well that is unless I keep getting beautiful girls to give me free desserts, then I wouldn't mind the trip each time. Thanks again everyone for reading and I hope you stay along for the ride. 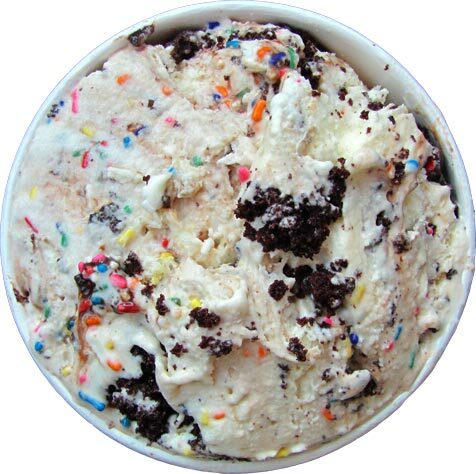 Have a great day and keep on scooping! Happy 3rd Anniversary Nick; I remember when you first came on board! I've enjoyed your reviews and can't believe it's been 3 years already. "It tastes almost identical to liking the spoon when making a cake. Sweet, slightly eggy, and delicious." Jilliann, so essentially you're telling me to create a banana fudge brownie flavor? I can get behind that. Anon, it was delicious. Thanks for being with me from the start. I can't believe it has been 3 year either. Feels just like yesterday I was passed out in the BK parking lot from their Gingerbread Shake. TTB, I missed a letter, my bad. Happy Anniversary, Nick. Your ice cream knowledge is years beyond your physical years. I most definitely appreciate your dedication to hunting down premium ice creams and even taking blows for the team by indulging in the not so premium ice creams. Keep up the great work. P.S. Still waiting for you guys to track down the Salted Peanut Caramel & Tiramisu Talenti flavors. Anon #2, but then it wouldn't be a remix! Kaitlyn, let us know what you end up getting on your next trip. John, thank you for all the kind words. It really means a lot! As for the salted peanut caramel, it is delicious like Dubba said. Almost like the inside of a snickers bar. Still no luck trying to find that dang tiramisu though. My fault, guys. I somehow completely missed that review. But yeah, you had me sold with the "inside of a snickers bar" description. I'm gonna attempt a search for it as soon as I muster up the strength to put this raspberry cheesecake pint down. @John: AHHHHHHHH!!! Still cant find that one! John, agreed on the raspberry, so good. My review will be up later this week.